Claude Debussy, a composer at the forefront of French Impressionism, wrote some awesome preludes and many other great Composer of the Week-worthy pieces! A prominent and very talented French composer at the turn of the 20th century, Claude Debussy’s iconic compositions bridged Late Romantic Era music with 20th Century Modernism. His experiments with chord structure were demonstrated in numerous orchestral works, piano works, and even in four ballets. Debussy had many tumultuous and sometimes overlapping romantic relationships in his lifetime. One of his famous works, Children’s Corner, was dedicated to his only child — daughter Claude-Emma. Debussy’s work shimmers like a lake on a sunny day, and pieces such as Prelude to the Afternoon of a Faun and Children’s Corner are absolutely enchanting. 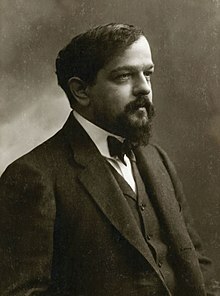 In addition to being influenced Wagner and prominent Russian composers such as Tchaikovsky, Mussorgsky, and Rimsky-Korsakov, Debussy also studied non-western composition techniques and was particularly intrigued by Javanese gamelan music. Literary and visual arts also played an important role in Debussy’s compositional development. -Debussy’s Preludes are fantastic, as are Children’s Corner, Prelude to the Afternoon of a Faun, and the famous La Mer. -Some great samples of Debussy’s work are available in the “Media” section of his Wikipedia page.